When it comes to amazing, once in a lifetime experiences, drifting over the English countryside in a hot air balloon has got to be top of the list. 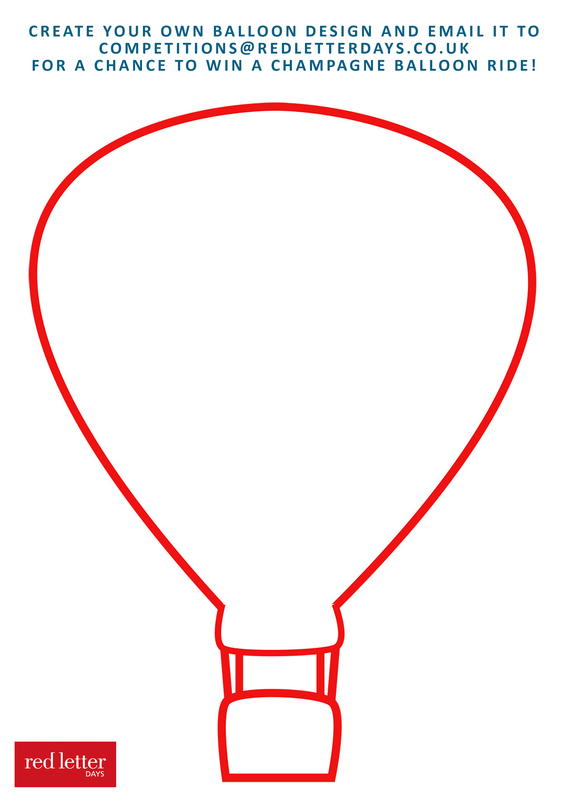 There are no questions to answer this time, just a task: we want you to design us a balloon using the template below – just click on the image to download. Be as artistic as you like – you can design it on the computer, get on your iPad, or print it off and draw by hand and scan it in – entries will be judged on their creativity, originality and general brilliance. By entering this free Competition you agree to these Terms and Conditions. This competition is open to residents of the UK and Eire, except for employees of Red Letter Days, their immediate family members, or anyone else associated with this competition. The prize cannot be exchanged for cash or any other alternative. The prize is non-transferrable, and non-refundable, and must be taken as offered. The sunrise Champagne Hot Air Ballooning Experience must be taken within 12 months. To enter this free Competition, you must submit your balloon design, using the official template, and e-mail it to competitions@redletterdays.co.uk . The competition opens on Wednesday 29th January and entries must be submitted by Tuesday 4th February at 12:00pm. The judging will take place Wednesday 5th February 2014 and the winner, and their design will be announced on the Red Letter Days Facebook and Twitter pages on the same day. The winner will be selected by the Red Letter Days Head of Online, and originality, creativity and uniqueness will be considered as criteria in the judging process. Entrants must submit their name and a valid email address. Entrants can only enter once per email address. Any entry which breaches these rules will automatically be disqualified. The winner will be notified via their entry email address, and Red Letter Days’ decision will be final. No correspondence or discussion shall be entered into. If the winner has not responded within the seven days following notification, then the prize is forfeited and a new winner will be selected. By entering the free Competition, the winner agrees to participate in such promotional activity and material as Red Letter Days may require. The winner’s name will be available for two weeks after the competition, by sending a SAE to Joshna Patel at the address below.